Carver's stylish 450 Voyager is a head-turner in any harbour with styling modeled after the popular 530 Voyager. She's built on a solid fiberglass hull with an all-fiberglass stringer system for optimum strength and resistance to moisture, and incorporating prop-pockets to reduce draft and level the engines. Structurally integrated frameless windows allow larger glass panels and smoother, more graceful styling. 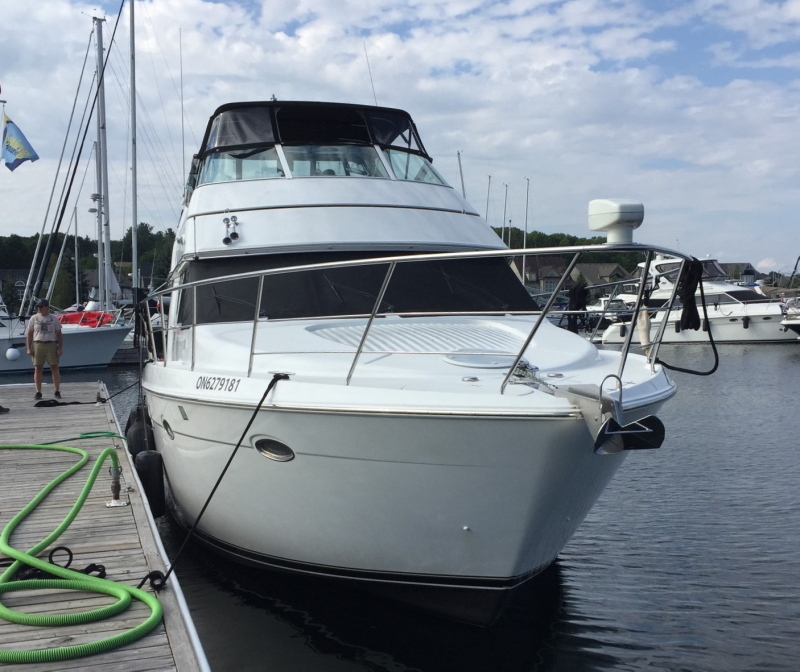 This 450 Voyager is a Great Lakes freshwater vessel and has been diligently maintained and serviced from the get-go. Currently in winter storage, she's scheduled for a hull compound and buff as soon as spring arrives and the wrap comes off. This boat is well equipped with accommodations and great suite of amenities. Cruise in comfort in dual captain's chairs on the bridge, or in the warmth and comfort of the luxurious raised pilothouse below decks. The bridge features a curved lounge for six plus a wet bar, hi-lo table and plenty of storage. The entire bridge is canvas-enclosed, including the aft section that can double as a dinghy storage area. A electric boom-lift allows an 8' dinghy to be stored up-top, high and dry and safely out of harm's way. Molded steps lead down to a roomy aft cockpit with molded-step side deck access, equipment storage compartments and easy engine compartment access. An integral swim platform with concealed fender storage wells completes the picture. Step into the salon and you're surrounded by rich cherry wood cabinetry, solid surface countertops and loads of warm natural light. Relax in the main salon with Ultraleather sofas with incliners, enjoy conversation and a refreshing drink from the wet bar with your guests, listen to music or watch the game. The fully-equipped raised pilothouse features a curved dinette lounge with seating for four, fully adjustable power helm seat and overhead electronics console. The master stateroom offers an island queen berth with innerspring mattress, loads of storage and access to a private head. Your guests will appreciate the forward stateroom's queen-size island berth and private access to the forward head compartment. Reliable and fuel-efficient power is provided by twin 430hp Cummins 450 Diamond diesels, the most sought after marine diesel in both recreational and commercial markets. And should the situation call for maximum maneuverability, bow and stern thrusters are at your finger tips. An all-round great cruising package that will stand above the crowd in any harbour.